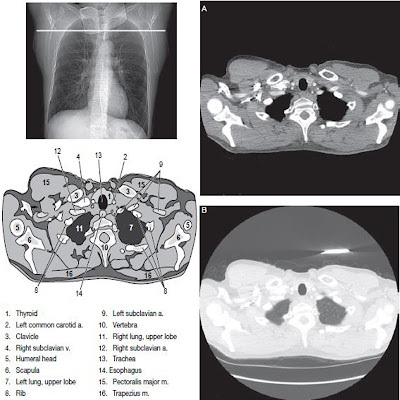 Skull fractures (medial and lateral displacement), neoplastic processes, and Paget's disease are demonstrated. Remove all metallic or plastic objects from the patient's head and neck. Take radiograph with patient in the erect or prone position. Let the patient's nose and forehead rest the against table or Bucky surface. Slowly flex the patient's neck as needed to align Orbito Meatal Line (OML) perpendicular to Image Receptor. Align midsagital plane perpendicular to midline of the grid or table or in bucky surface to prevent head rotation and or tilt. Center Image Receptor to Central Ray. Angulate Central Ray to 15° caudad and center to exit nasion. Alternate with CR 25° to 30° caudad, and center to exit at nasion. The Minimum SID is 40 inches (100 cm). An altenate projection is a 25° to 30° caudad tube angle that allows better visualization of the superior orbital fissures, the foramen rotundum, and the inferior orbital rim region. CR exits at level of nasion. Note: Decreases caudad angulation of the CR to 15° and/ or increased patient's neck flexion (chin down) will result in projection of the petrous pyramids, to the lower third of the orbits. 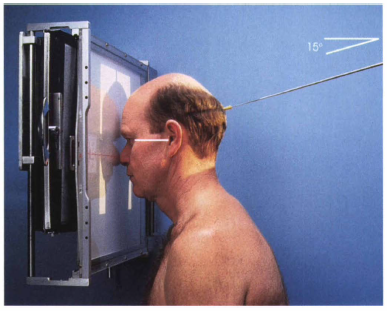 For patients who are unable to be positioned for a PA projection (e.g., trauma patients), an AP axial projection may be obtained with the use of a 15 ° cephalic angle, with the OML positioned perpendicular to the IR. 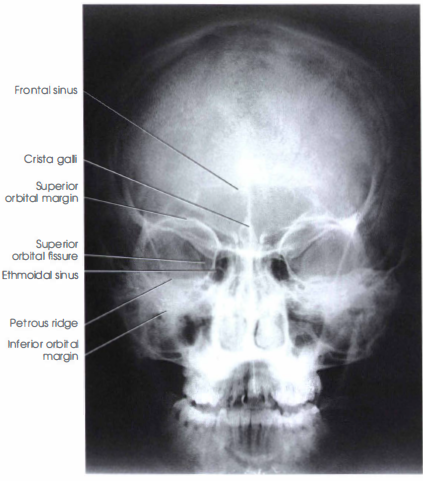 The greater and lesser sphenoid wings, frontal bone, superior orbital fissures, frontla and anterior ethmoid sinuses, superior orbital margins, and crista galli are shown. In addition to the structures mentioned previously, the foramen rotundum adjacent to each inferior orbital rim is visualized, and the entire superior orbital fissures are visualized within the orbits. No ratation as assessed by equal distance from the midlateral orbital margins to the lateral wall of cranium on each side, superior orbital fissures symmetric within the orbits, correct extension of neck (OML alignment). No tilt with the MSP exactly perpendicular to the IR. Petrous pyramids are projected into the lower one-third of the orbits. Superior orbital margin is visulized without superimpostion. Petrous pyramids are projected at or below the inferior orbital rim to allow visualization of the entire orbital margin. Entire skull is visualized on the image, with the nasion in the center. Collimation borders are to outer margins of skull. Density and contrast are sufficient to visualized the frontal bone and sellar structures without overexposure to perimeter region of skull.